It was Nov. 20, 2013. My parents 36th wedding anniversary. My parents said they would watch my daughter so I could go hunting. It was a clear, windless, afternoon as I snuck into our "old faithful" treestand dad put up years ago. Nobody else was hunting... the mountain was quiet and calm as I climbed into my stand to wait for sunset. I checked my cell phone..and it said 3:12 pm. As I leaned back against the tree a lifetime of memories of my family flooded through my mind. Now keep in mind, I am a disabled hunter...from child hood cancer when I was 10 years old. So my hunting places are limited. As I sucked in a breath of cool fall air I felt confident as the sun started to sink towards the horizon behind me. Straight ahead of me was the hedgerow connecting mountain to mountain... approximately 80 yards away. To the left of me was the top of the mountain swamp that meets the scrub field, popular, briar, white pines patch strip that the deer love to sneak through and bed down. To the right of me, just below me, was a stand of white hedgerow pine that blocked the bottom of our tree stand. Then, all of a sudden, movement caught my eye below me. This Slammer Buck steps out on the "old tractor" road dad had made years ago when working on the horse farm... not even 30 yards from the stand. Clueless that I was in the tree stand not far away. He walked out shaking his head like a little boy wanting to fight and play. 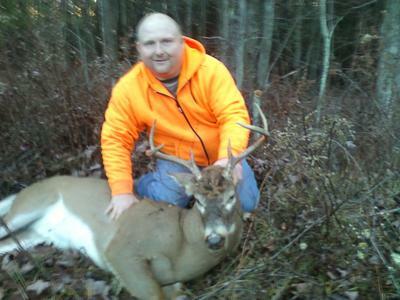 Quickly I knew this was a shooter buck for sure. I told myself not to concentrate on his horns and that with five steps he would be behind the tall white pine tree...at which I could raise my .300 savage model 99 feather weight. What seemed like hours was only seconds as he stepped behind the tree. My rifle rose... safety off. I waited for an eternity as he stepped out from behind the pine and turned to walk toward my stand! HOW could I get so lucky! As soon as his front half cleared the pine the cross hairs found their mark and the 150 grain lead found its mark truthfully. The buck staggered and went on his "death run" straight toward me and the swamp. In a nano second I worked the lever and slammed another shot into him... not taking any chances. 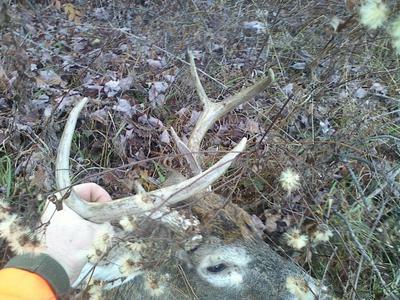 He piled up not 10 yards from my stand. 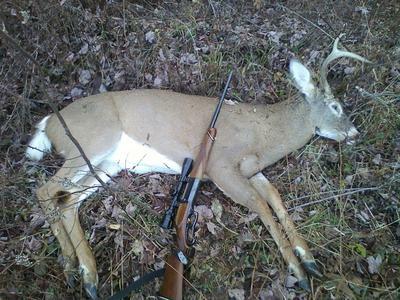 He is a SLAMMER 6-point with an outside spread of 16 3/4" and huge main beams. An estimated weight of approx 135lbs. The Lord could not have blessed me on a more sacred day. 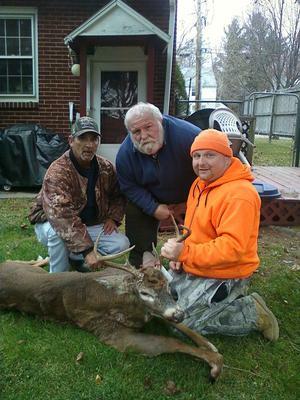 My parents 36th wedding anniversary...as I dedicate this buck and my lifetime to the love of my parents. A quick text to my Dad and he was on his way to help gut and drag. Yet another deer with my Grand-Fathers Knife. This is what hunting is about. The memories and God gifted moments...silenced in time.